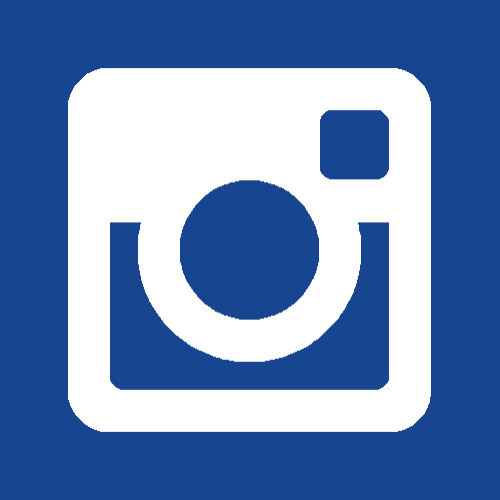 Upon disassembly and inspection, Hydro Scotford discovered that previous repairs from other service providers were low quality repairs that were performed hastily to return the pump to service. 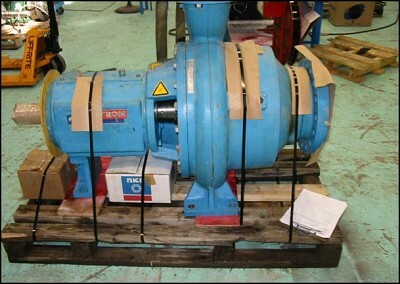 Hydro Scotford completely reverse engineered this pump and developed a comprehensive repair scope which the end user accepted and utilized as a standard for developing future repair plans. 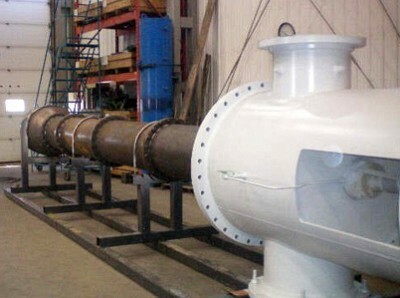 Hydro Scotford reverse engineered this pipeline pump and re-rated it to meet new hydraulic conditions specified by the end user. All parts required during the rebuild process were provided by Hydro Scotford. 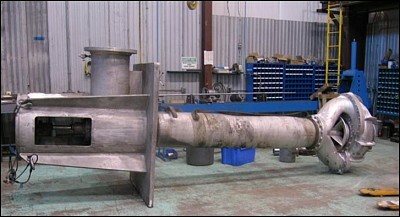 Hydro Scotford implemented metallurgical upgrades to this pump to ensure it would withstand abrasive service. 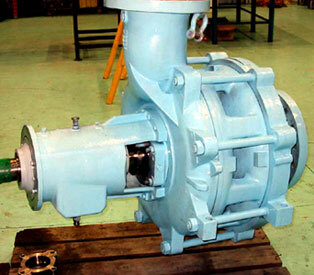 An upgrade or change in metallurgy can extend a pump’s mean-time-between-repairs. 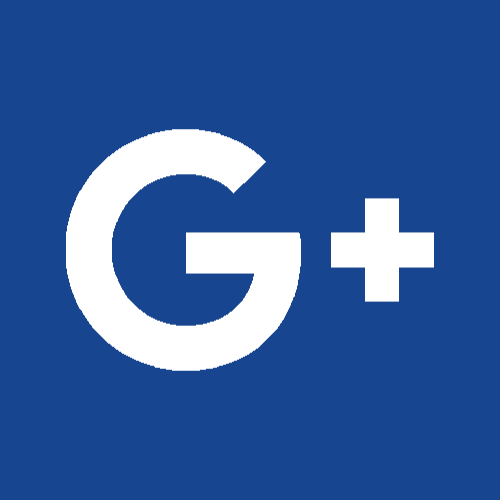 Hydro's engineering team will evaluate the metallurgy of your pump components and recommend material upgrades specific to your pump’s application. Hydro Scotford completed an emergency repair in less than 5 weeks. 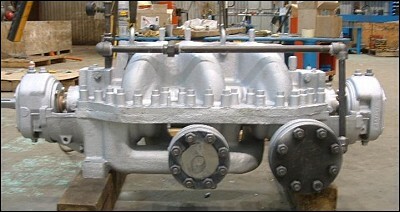 This quick turnaround included the manufacture of new diffuser castings on this critical spare boiler feed pump. In a 10 day period, Hydro Scotford received, dismantled, inspected, weld repaired, line-bored, hydro-tested, assembled and shipped this pump. 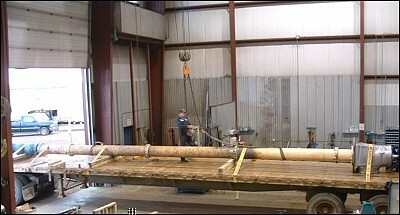 Hydro understands that when an emergency occurs, you need to get your process or plant back up as quickly as possible. Hydro offered value to this pipeline pump user by extending our engineering expertise and implementing pump reliability improvements for this vertical pump. 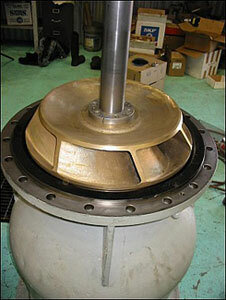 Hydro Scotford rebuilt this vertical pump using stringent repair specifications. 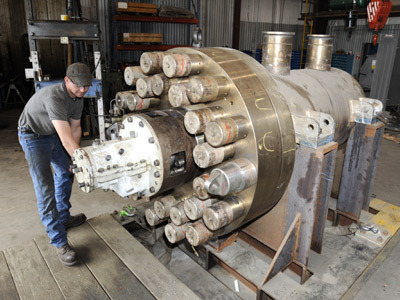 Hydro is a leader in the engineered rebuild of vertical pumps. 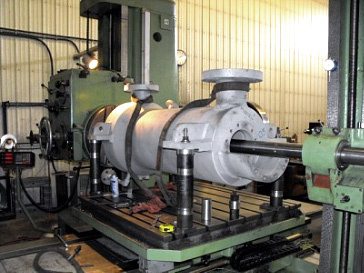 The photo above shows the method of analysis for checking the concentricity and parallelism of the pump barrel. After a thorough inspection, sometimes referred to as "barrel mapping", Hydro recommends a detailed plan for bringing the condition of the barrel back to its original specifications. 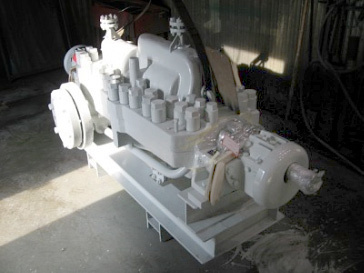 Hydro is one of the only independent pump rebuilding companies with the in-house capability and experience to perform hydraulic design modifications and upgrades. 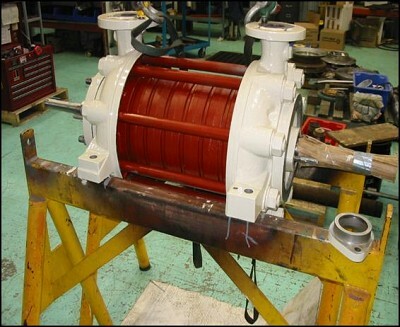 Hydro Scotford provided an engineered rebuild for a pipeline, re-rating this pump to meet new hydraulic conditions. Hydro Scotford has a well-equipped service center with large machine tools and substantial crane capacity which enable us to efficiently work on large circulating water, river water, and other vertical pumps. 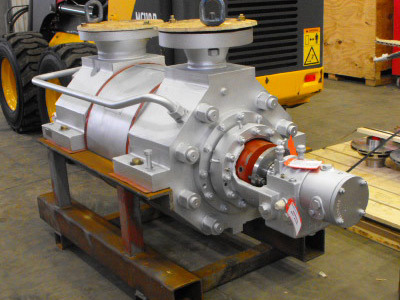 This pump from a power plant required a 2-week emergency turnaround. After 500 man hours, the pump was disassembled, cleaned, inspected, repaired, rebuilt and ready to ship 12 hours ahead of schedule. Hydro repaired the column, bowl, suction bell, line shaft, bowl shaft, impeller, and added a new head shaft with upgraded packing areas and two new couplings with coupling nuts. 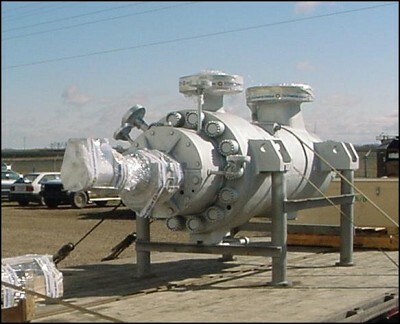 This pump, which operates in an application for the oil and gas industry, was rebuilt by Hydro Scotford. 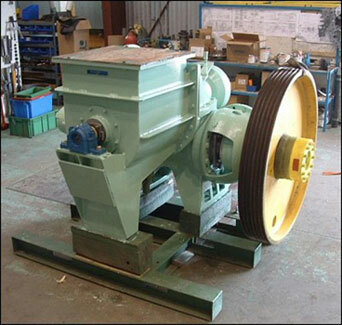 Hydro Scotford provides engineered pump rebuilding for horizontal, vertical, and submersible pumps. 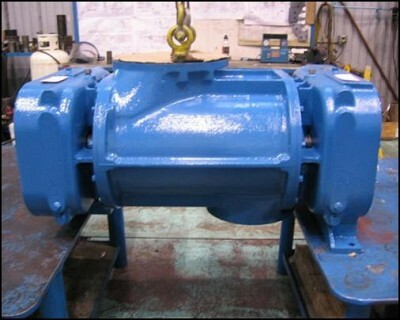 Serving an end user in the oil and gas industry, Hydro Scotford repaired and upgraded this pump with composite materials. The pump was also reverse engineered so a future hydraulic re-rate could be performed. 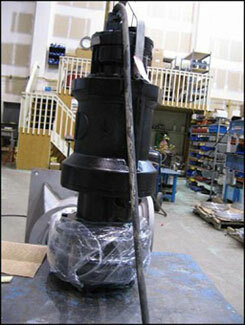 This IDP vertical pump experienced repeated failures due to chemical erosion. 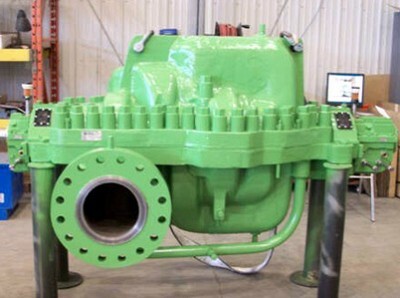 Hydro Scotford redesigned and upgraded this pump during the rebuild process to increase the pump’s resistance to the abrasive service and improve mean-time-between-repair. 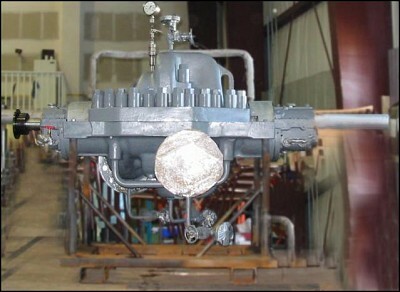 When this boiler feed pump failed due to a dry-run event at a power plant, Hydro upgraded the pump with composite wear materials. Composite materials have been proven to increase efficiency and lengthen the life of boiler feed pumps. 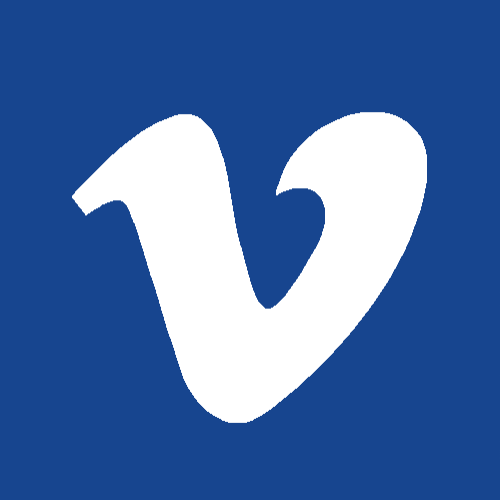 Non-galling characteristics result in longer run times and safer pump operation. Lower clearances reduce internal pump recirculation, providing equal flow with reduced use of horsepower, resulting in improved efficiency and reduced operating costs. Rotor stability is improved and vibration is reduced which extends the life of bearings and mechanical seals. Hydro Scotford upgraded this vertical condensate return pump with composite line bushings to improve rotor stability and extend service life. A power plant sent their river water pump to Hydro Scotford for repair. Hydro Scotford improved the fits and tolerances as well as implemented upgrades to reduce vibration, increase bearing life, reduce power consumption and extend the pump's mean-time-between-repair. This pump, from a kraft pulp mill, processed black liquor. After performing a thorough inspection, Hydro Scotford recommended a repair plan that included machining new wear rings without slots to prevent abrasive materials from damaging the case and minimizing wear behind the casing wear rings. Hydro also designed and machined a 4-bolt split packing gland follower to help maintain alignment of the packing gland follower with the stuffing box. 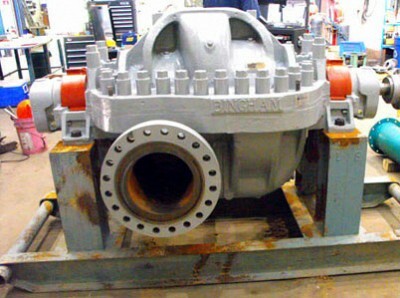 This engineered pump repair enabled the pump to process more than 1200 tons of material per day. 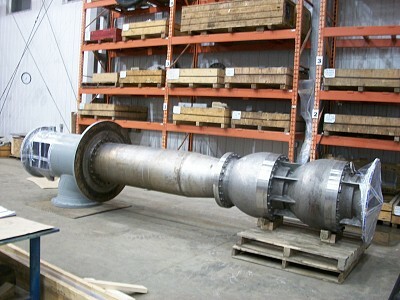 This pump, which was in high-pressure shower water service at a pulp and paper mill, was prone to failure from dry-run events. Hydro Scotford provided engineered pump upgrades during the repair process which would enable to pump to produce the required flow and head during short dry-run events. Because Hydro is solution-based and customer-focused, we are committed to rebuilding pumps from all major pump manufacturers in many types of service. Hydro Scotford rebuilt this unique pump which operated in a thick stock application at a pulp and paper mill. 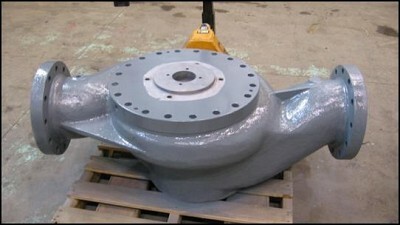 Hydro Scotford refurbished this impeller for an Ahlstrom voith fan pump used in a paper mill. The outside diameter was built up by 0.750" then the impeller was machined and hand dressed. 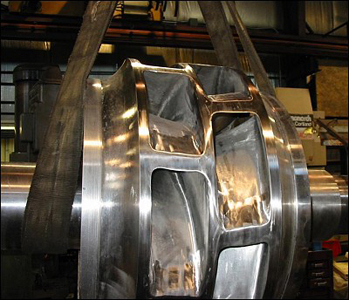 Hydro Scotford not only refurbishes impellers, we manufacture high quality, repeatable parts utilizing our parts manufacturing center, complete with coordinate measuring machine (CMM), CAD/CAM and CNC tools. Hydro Scotford reverse engineered and manufactured a new impeller for this Ingersoll Rand pump in service at a power plant. The photo above shows the new impeller installed in the bowl assembly. Hydro Scotford utilizes a vertical assembly pit to ensure tight running clearances for improved pump efficiency. 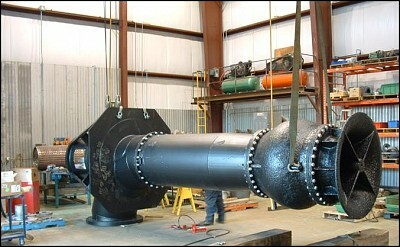 Hydro Scotford reverse engineered and rebuilt this pump for a paper mill. 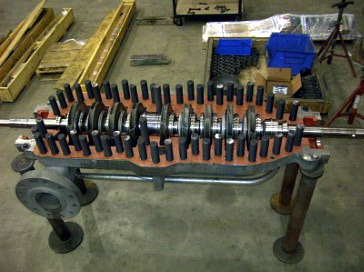 The rebuild included new parts which were manufactured in-house by Hydro Scotford. Upgraded materials and coatings were also provided. Quality and reliability in submersible pump repair requires specialized training in both pumps and motors. 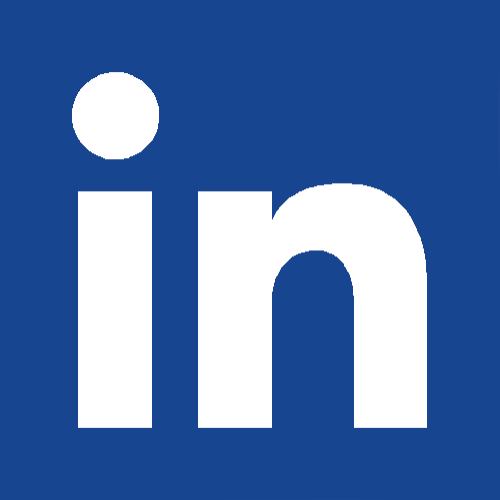 For this reason, Hydro formed a completely separate service division dedicated specifically to submersible pumping technology. 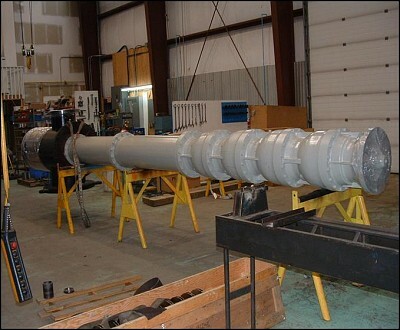 With stringent repair processes and standards designed to improve the performance and extend the life of the equipment, Hydro is experienced in evaluating and servicing submersible equipment from most major manufacturers. 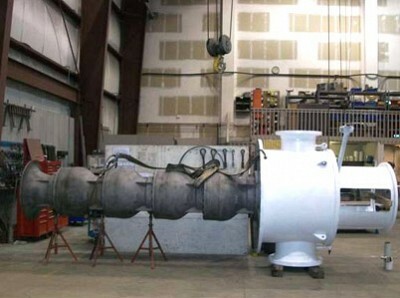 Hydro Scotford has experience refurbishing blowers and compressors. 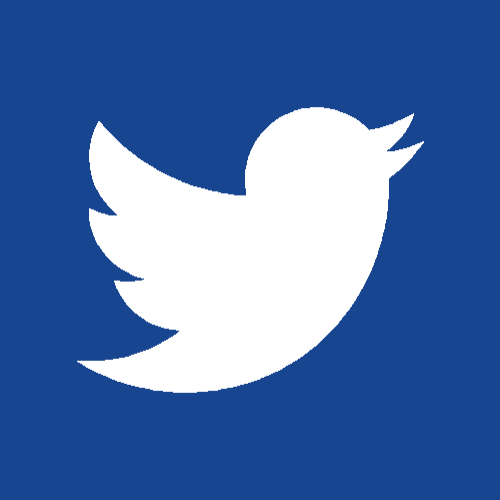 Hydro’s engineering experience and in-house resources enable us to cost effectively repair and renew your equipment. 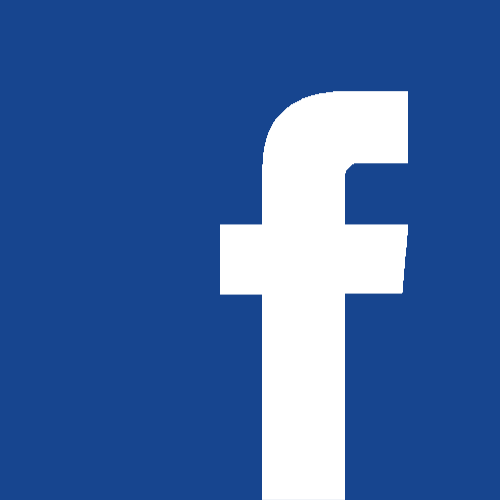 Instead of just changing parts, we evaluate the condition of each component because existing parts can often be repaired or renewed. Hydro Scotford has the capability to reverse engineer and supply many unique parts. 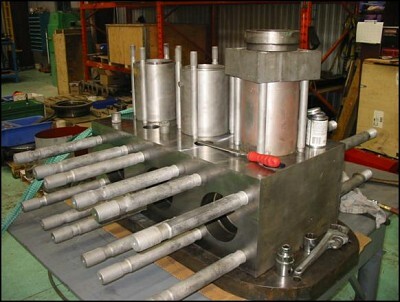 The photo above shows a fluid block which was manufactured by Hydro Scotford for an end user in the oil and gas industry. This pump was upgraded and rebuilt by Hydro Scotford.